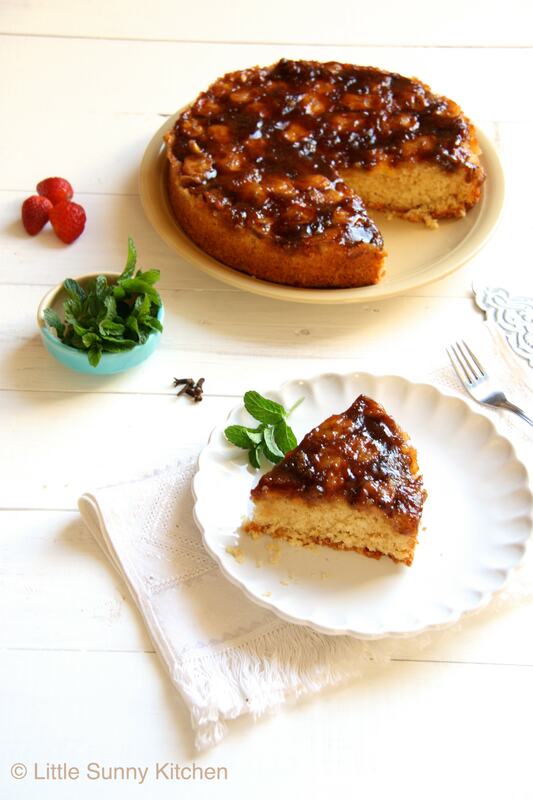 Bolo de Banana Caramelada… A spriced banana upside down cake with a Brazilian twist! After trying the pineapple upside down cake last week and falling in love with it, I decided to go on Pinterest and look at more upside down cake pictures, that gave me loaaaaaads of fantastic ideas!! Basically you can add any fruit to your upside down cake! Apples, oranges, strawberries, pineapples, cherries, pears, bananas! You name it! I like to keep things simple and easy, plus I never throw any food away. So after roaming in the kitchen this afternoon and seeing 3 over-ripe bananas I decided to make an upside down cake using the bananas (: And to add a twist to the cake, I added spicy glaze to it (with cinnamon, nutmeg, and cloves! and of course brown sugar) that made my kitchen smell like Christmas! 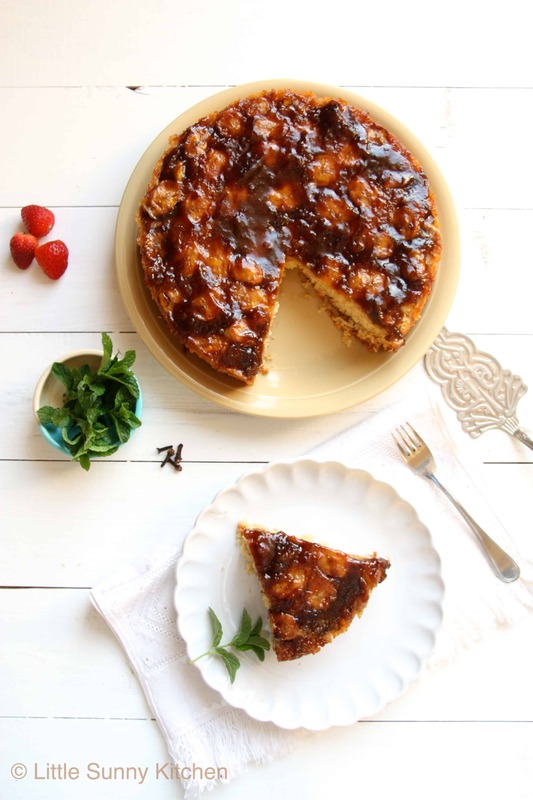 You have to try this cake to understand what I am talking about, you will love the spongy moist slices of cake topped with caramel bananas that taste and smell like HEAVEN. Grease a 9 inch pan with oil and preheat oven to 180°. Beat the butter with sugar until smooth and creamy, then add the vanilla and mix. Add 2 egg yolks and beat well. Add the flour, salt and baking powder to the mixture and mix. Followed by the milk and mix well. Beat egg whites with cream of tartar (this should take a couple of minutes) then gently fold in the mixture into batter using a rubber spatula. To prepare the topping, in a sauce pan mix the butter with the brown sugar and spices on medium heat, using a spoon mix to prevent it from being burnt until the sugar dissolves. Remove from heat. 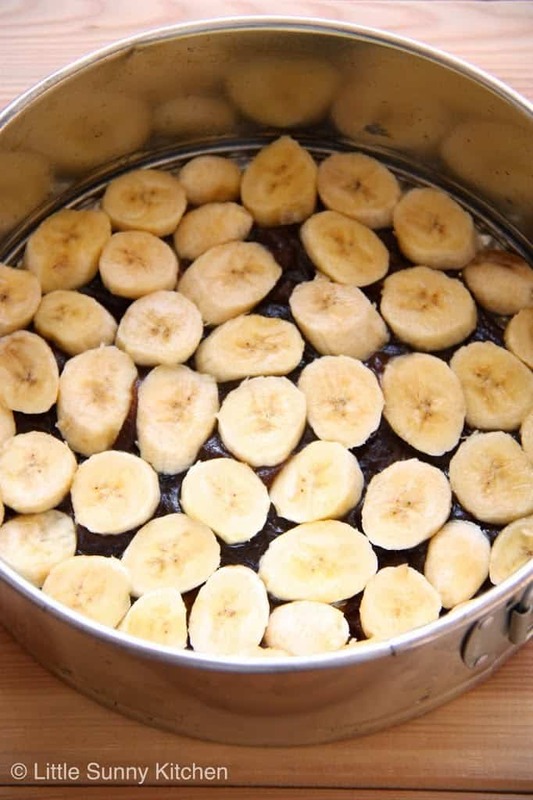 Pour the caramel mixture into greased pan, then arrange the slices of the bananas on top. Next, pour the batter into pan and smooth the top. Bake for 50-60 minutes or until a toothpick inserted comes out clean. 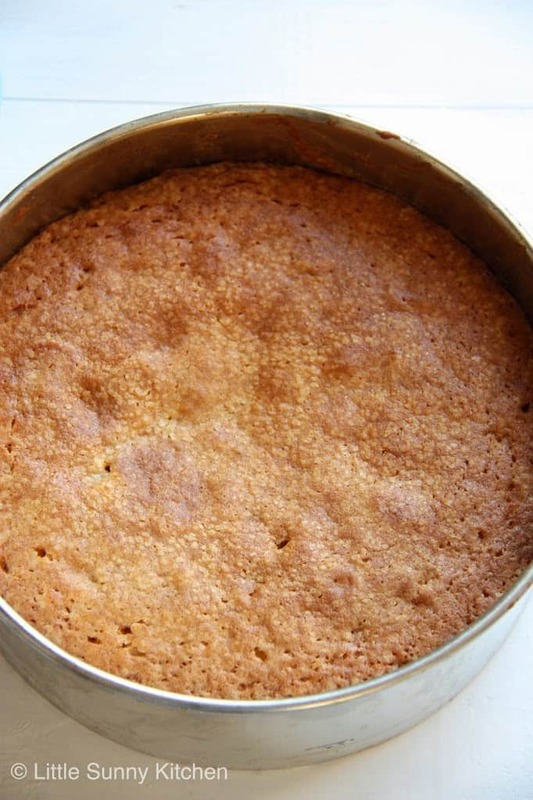 Let the cake cool down for 10 minutes. Diana: Thanks for linking back to me. I am happy that you tried this cake and enjoyed it a lot. My family and I love this cake as well. Wishing you a wonderful weekend!